Madeleine E. is out now, from Outpost19. Named one of 2016's best books by The Believer, VICE, Gulf Coast, Essay Daily, HTMLGIANT, Vol. 1 Brooklyn, and Drawn & Quarterly. "A unique, curvilinear collage of texts found and imagined . . . a biography-in-fragments that fingers the cracks in its own composition and emerges with a unique form that’s neither quite fiction, essay, or film critique but partakes of the pleasures of all three." "[Madeleine E.] very quickly takes on a mysterious, drug-like momentum of its own. Like a great mystery film, it makes you want to poke holes in all the storylines around you. It's a refreshing, haunted take on the essay and the memoir, one that complicates both by refusing to let you say for sure where either ends." "Complex, melancholy [. . .] Madeleine E. is a layered patchwork of quotes and the author’s cinematic analysis, memoir, and fiction." "Art is an excellent medium for experimenting with things halfway between ideas and feelings, and Madeleine E. does this without banishing the intellect to the back of the house, as in a fable or allegory, or engaging in that philistine tiger-taming Sontag complained about, vainly attempting to mollify the foreboding at the heart of its subject matter (Vertigo), which as a genuine work of art resists all intellectual corralling." 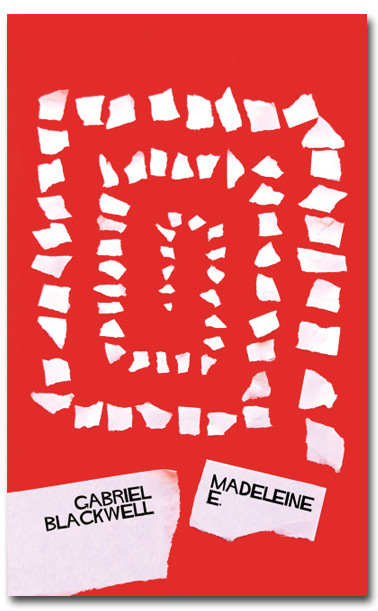 "Madeleine E. is a riveting examination of the self (or selves), spun from the yarn skein in Gabriel Blackwell's labyrinthine mind. Using Hitchcock's masterpiece Vertigo as a springboard for cultural and critical investigation and personal narrative, Blackwell has managed to write an impossibly entertaining book—indeed, a philosophical page turner." "The first time I saw Lynch’s Mulholland Dr., I watched it again immediately, so mesmerizing was its world. I’ve done this with a few other films, but never with a book—until now. Once I got to the last page of Gabriel Blackwell’s genre-transcending Madeleine E., I quickly returned to the first. The book is as captivating and addictive as Vertigo, the film Blackwell illuminates and re-imagines. On the level of criticism alone, the book is revelatory: Hitchcock has never appeared so engrossingly strange and alive. But Madeleine E. is also a profound exploration of identity, doubling, obsession, romantic love, perception, falling, the power of art. Interspersed among the collages of philosophical insight are hypnotic narratives about a man named Gabriel Blackwell, whose many possible lives reveal the dizzying potentials of our own. This is a wondrous book." "Madeleine E. breathes new life into the novel, the monograph, the commonplace book, the memoir . . . This is a book that will be treasured by readers who are eager to glimpse the horizons of contemporary writing as well by those who appreciate a good old-fashioned page-turner. Gabriel Blackwell’s writing proves that a genre-defying literature is not only possible, it’s necessary."